Neil Ruffner, right, and Rick DeVree of Ruffner Construction Inc., work to place the bell tower roof on its base on the roof of New Groningen School, which is being renovated by the Zeeland Historic Society. Contractor Neil Ruffner, right, checks the level of the bell tower base after it was lowered onto the roof of the New Groningen School on Paw Paw Drive Tuesday. 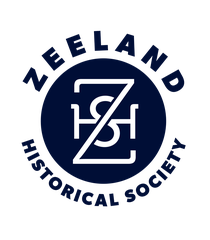 The icing on the cake came a little early for the Zeeland Historical Society, but nobody seemed to mind. Earlier this week, a crew from Ruffner Construction Inc., erected a new bell tower atop the 128-year-old New Groningen School, and placed within the tower the original bell that called students to school more than a century ago. "That was kind of the motto of the whole project, 'The bell will ring again,'" said Amy Langeland, past president of the Zeeland Historical Society, which purchased the school in 2006 and is in the process of restoring the building to is original condition. The society is nearing the completion of Phase One of the project, which involves primarily exterior improvements, including sandblasting the Veneklasen bricks to their original buff tan color. All of the windows will be replaced with period replicas, a handicap accessible ramp was added out back and a new parking lot was poured on the east side of the building. Langeland was hoping the bell tower could be the finishing touch that capped off the renovation, but two benefactors stepped up with generous donations, pushing the timeline ahead. The original school bell was donated to the society by the Sterken family after hanging in front of its historical farm house on James Street for years. An anonymous donor agreed to pay the $9,000 for the bell tower, so the society decided to go ahead with the project now. 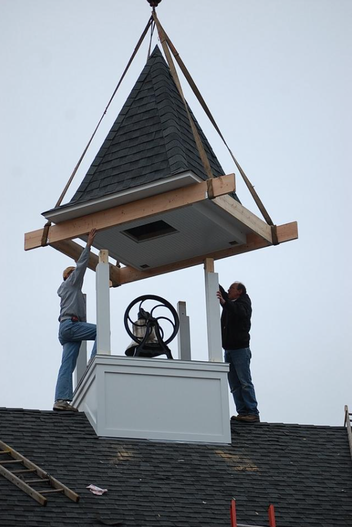 Neil Ruffner, owner of Ruffner Construction, built the 5-foot by 5-foot bell tower base and the roof inside his Zeeland warehouse, then moved it in pieces to the schoolhouse this week. The base was installed Tuesday and the bell and tower roof went up Wednesday. Because of the age of the building, Ruffner said he built a template of the base first, then took the template to the warehouse and used it as a pattern, ensuring a snug fit when the base was lowered by crane onto the lopsided roof. Ruffner said the brass bell and its cradle weigh about 400 pounds, while the tower base and roof weigh almost a ton combined. It was more weight than the school’s roof structure could hold, so Ruffner added some interior load-bearing walls, essentially making the towers support a floor-to-roof structure. The bell, despite being outside unprotected for years, was in solid shape. It needed little more than a cosmetic makeover. The restoration responsibility landed in the lap of Bill McMurray, whose Zeeland company, McMurray LLC, specializes in restoration of antique lighting. McMurray polished, buffed and clear-coated the bell, then reattached it to the cradle, making sure to use heavy-duty hardware.